The BLUU Story is meant to help document the faith and organizing journey of a group of Black organizers. We created it to help people understand what we’ve accomplished in our three years of existence. When we first met at the convening for Black Lives in July 2015, we didn’t know we’d be starting a new organization or a new faith community--yet we ended up doing both. The Black Lives of Unitarian Universalism Organizing Collective (BLUU OC) is a group of people that came together out of a need for spiritual connection and commitment to creating a more just and loving world for Black people. Since our kickoff in September 2015 with the Seven Principles of the Black Lives of Unitarian Universalism--our take on the Seven Principles of Unitarian Universalism--we have been striving to live ever more deeply into our principles. While only two of the co-founders who were at the luncheon where it all started remain on the lead team, the current OC remains committed and clear to a vision of UUism that is liberatory and life-giving for Black people. We are encouraged by the example of our predecessors in our faith: the Black Affairs Council and the Black Unitarian Universalist Caucus from the late 1960s. We are heartened and grateful for the guidance of our Elders 360 Council, which includes Dr. Mtangulizi Sanyika, a co-founder of BAC/BUUC. We are also grateful for the presence of Paula Cole Jones, Rev. Mel Hoover, and Rev. Susan Newman Moore on the current BLUU 360 Council. We are grateful to have their knowledge, insight, and guidance as we seek to continue the vision of a spiritually liberatory faith community and organizing force for Black people both within UUism and outside of it. We invite you into our journey, whether you’re a Black UU or one of our supporters. This document is meant to help many who have asked how we started, why we do what we do and our vision for moving forward. We strive to be a dynamic, nimble and responsive group of loving and fierce Black UUs in the world, committed to supporting Black UUs, increasing our power and capacity as Black UUs and justice-making and liberation through our faith. This is where we’ve come thus far. May we continue to live into our deepest faith values. In July 2015, a group of Black Unitarian Universalists met at the Movement for Black Lives Convening in Cleveland, Ohio. The convening had hundreds of attendees, and the dozen or so Black UUs in attendance dreamed up a cohesive, national, vibrant community of Black Unitarian Universalists. Black Lives of Unitarian Universalism (BLUU) formed out of several conversations among Black UUs at that gathering. The July 2015 conversations came on the heels of an intense, charged June 2015 UUA General Assembly, held in Portland, Oregon. Black Unitarian Universalists called on white UU persons and power structures to fortify support of the burgeoning Black Lives Matter movement. Rev. Amanda Weatherspoon, a Black UU minister, co-led a 200-person die-in and rally on the Assembly’s final day that captured the attention of the larger gathering. Black UUs who attended GA 2015—along with many who couldn’t afford to go—began to feel like a movement was bubbling inside Unitarian Universalism. Leslie Mac, Lena K. Gardner and the Rev. Carlton Elliott Smith were among the participants of those July 2015 conversations, as well as Raziq Brown, Ndidi Achebe, Dr. Royce James, and Isis James. Later, Leslie, Lena, and Carlton, joined by Elandria Williams and Kenny Wiley, formed what became known as the Black Lives of UU Organizing Collective, colloquially known as the BLUU OC. The quintet of leaders held numerous online meetings, and quickly established communication channels via Facebook and text messaging, as well. The BLUU OC’s geographic “challenge” of having its leaders situated in five different states and three time zones helped the group to think nationally, and also to think virtually. The OC, always in communication with other Black UUs throughout the country, worked together in the summer and fall of 2015 to create the Seven Principles of Black Lives. During the week of September 14, 2015, the BLUU OC rolled out one principle per day via Facebook, Twitter, and Medium. The Principles, modeled after the Seven Principles of Unitarian Universalism, were shared hundreds of times by UUs of a variety of racial and ethnic backgrounds, and helped spread the word that Black Lives of UU was an entity to be reckoned with. BLUU leadership, along with hundreds of Black Unitarian Universalists spread out across the faith’s 1,038 fellowships and congregations—and others who have felt unwelcome in traditional UU congregational space—took this principle to heart. “Those who have been marginalized must be trusted to lead the way,” BLUU says. And that meant, among other things, getting a record number of Black Unitarian Universalists to General Assembly 2016, held in Columbus, Ohio. BLUU requested funding to help get Black UUs to General Assembly from the UUA. The UUA Stewardship and Development Office, the UUA Board, and the BLUU OC worked together to fundraise toward the effort to assist Black UUs to get to GA. BLUU coordinated the housing, transportation, and registration of nearly 100 Black UUs, who wouldn’t have otherwise been able to attend GA 2016. The result: Over 200 Black Unitarian Universalists and “UU-adjacent” Black folks were able to go to Columbus. The OC cultivated an explicitly Black healing space at General Assembly 2016 for the first time. Worships, conversations, workshops, and free community time facilitated and led by BLUU were, for many, the highlight of their GA week. The OC created and held workshops on anti-Blackness, on BLUU’s trajectory, and on Black UU history and Black UU stories that were, for the most part, open to any who wanted to attend. Multiple members of the BLUU OC addressed the GA delegates and attendees. In the 2016 year BLUU also led the closing worship for the entire General Assembly. It was a worshipful experience, bringing in Rev. Sekou & the Holy Ghost and an unapologetically Black theological and musical lens to worship. Following GA 2016, Black UUs nationwide continued to excitedly look forward to what was next—and, increasingly, to look back. Ever-more-explicit connections were made between the UU faith’s Black power struggle against white supremacy in church and society of the late 1960s and the modern-day movement to center Black people within the Unitarian Universalist framework. On Friday, October 14, during its three-day meeting, the UUA Board of Trustees agreed to provide $300,000 immediately to Black Lives of UU and committed to guaranteeing BLUU another $5 million in long-term funding for its efforts to support Black UUs and expand the role and visibility of black UUs within the faith. The presentation called for Unitarian Universalists to support—not just with words and banners but also with resources and funds—the work of BLUU, and of Black organizers around the country. This ask coincided with BLUU’s increased emphasis on joining and supporting justice work in a variety of arenas. The response to the UUA Board’s decision to fund BLUU caused excitement and hope throughout the denomination, and it also stirred up consternation and anger. For the vast majority of Black Unitarian Universalists, as well as many non-Black UUs of color, the decision was a signal that the faith was, at last, “ready to live up to itself,” according to former BLUU OC member Royce W. James. On Facebook post comment threads and in church coffee hours, some white UUs—and a relative handful of UUs of color—called the decision financially irresponsible, “white guilt run amok,” and more. The BLUU OC wanted to focus on truly helping Black Unitarian Universalists in their spiritual and personal lives, and set out to do just that. The need for fellowship in real, physical space was one of the first urgent needs recognized by the OC. As part of the presentation to the Board in October, the OC included plans for a Spring Convening. Using the recently committed funds from the UUA and its member congregations, BLUU held its first-ever Convening March 9-12, 2017 in New Orleans, Louisiana, with just over 100 Black UUs of all ages attending. The BLUU OC confirmed at that event that there exists an even deeper need than previously understood, within many Black Unitarian Universalists, a strong desire to experience embodied, spiritually rich worship, bask in a variety of musical offerings, and explore theological, spiritual, and social questions—all in spaces that are both unapologetically Unitarian Universalist, and unapologetically Black. In our Fall survey of Black UUs, both those who attended the 2017 Convening and those who did not, respondents made it clear that there exists a hunger for more of those kinds of spaces and events. At the Convening and at the subsequent Unitarian Universalist General Assembly in June 2017, Black Lives of UU and older Black UU leaders, like Dr. Mtangulizi Sanyika, who, as Hayward Henry in the 1960s, was a crucial part of the “Black Empowerment” struggle in the faith, spoke about the connection between the 1960s and the present-day movements for Black lives. A significant number of Black UUs in their 60s and 70s attended the convening, as did a dozen middle-and-high school-aged young people. During one particularly memorable morning session, a group of elders and the BLUU OC exchanged embraces and words of encouragement and love from the stage. The extemporized space included a “laying on of hands” directed toward the Organizing Collective, and a mutual promise between young, not-so-young, and elder folks to support and love one another as Black UUs. The four-day convening forged ties and connections between Black UUs in particular UUA regions, and also among Black UU middle and high school youth. Today, a Black UU can attend any regional or national UU event and know they will be far from alone. Expand the power & capacity of Black UUs within our faith. Provide support, information & resources for Black UUs. Justice-making and liberation through our faith. Expanding the power and capacity of Black UUs within our faith called on us to build an organizational structure that would help us simultaneously remain mindful of who and what came before us, hold the existing and developing work, and vision for the future. So we hired Lena Katherine Gardner as our Executive Director, Rev. Mykal Slack as our Community Minister for Worship and Spiritual Care, and Paige Ingram as our Community Organizer, as well as established the BLUU360 Elders Council, on which Miss Paula Cole Jones, Rev. Susan Newman Moore, Dr. Mtangulizi Sanyika, and Rev. Mel Hoover currently sit. We built out these roles at a month-long collaborative, relationship-building organizational retreat in New Orleans in 2017, and we continue to learn lessons from that retreat and what came out of it. Specific to the OC, we created our BLUU OC Working Agreements that remind us at every turn how to approach and hold the work and one another. Our power and capacity work has also called on us to partner and build relationships with beautiful, life-transforming people and organizations. BLUU came together with Side With Love in 2016, collaborating with Rev. Sekou & the Holy Ghost, for the #ReviveLove Tour to provide political and spiritual sustenance for the movement. Most recently in 2018, we partnered with Side with Love again to share theological reflections from Black UUs and to send a cohort to the Allied Media Conference in Detroit, MI. Partnerships also include providing funding to initiatives that support the ministries of Black folks, so in 2017, we gave $5,000 toward DRUUMM's Global Ministries project. We also contributed $5,000 to the Ending Cash Bail national campaign, and to Southerners On New Ground, SONG, to support their organizing to end the cash bail system. And of course, BLUU has put heart and soul into our own programming. Specifically, we built the BLUU Ministerial Network, a group of spiritually gifted souls who, through pastoral care, art, theological reflection, curriculum development, and the like, have made a commitment to support the care of Black UUs in the faith. We hold monthly online worship services and in April 2018, we also hosted RECLAIM, BLUU’s first Revival in Kansas City, MO and supported the attendance of nearly half the 115 participants with the leadership and support of a revival planning team and staff. A critical part of our work has been to provide support, information, and resources for Black UUs. It became clear that folks were seeking connection to other Black UUs, so we worked to grow the closed FB group to 610 members and the public-facing FB page to 6,652 followers. After the Spring 2017 Convening, we knew that folks were in need of spiritual care, so we developed and launched that May primarily virtual spiritual care programming that includes offering Daily Affirmations, facilitating meet-ups with Black UUs all over the country, and providing spiritual nourishment of all kinds, including a twice-monthly online worship service. 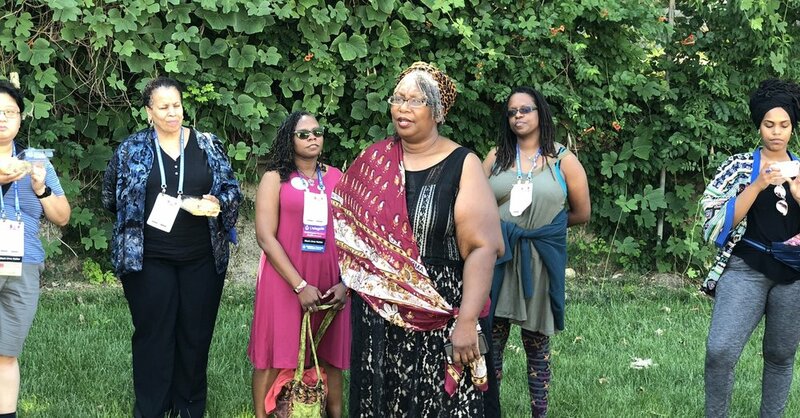 But there is nothing like being together as a Black UU community, so we developed more extensive programming in the Black Healing Space at GA 2017 and helped secure $150,000 in funding assistance for POCI people to attend GA, as well as continue to build out the impact of that space. We commissioned the Black Panther study guide when the movie opened and supported watch party events throughout the country. And in June 2018, we convened a BLUU Worship Team, who is tasked with developing online and in-person worship gatherings and rituals that center Blackness in our Unitarian Universalism. Justice-making and liberation through our faith begins with doing what we can to change the material conditions for Black people through on-the-ground organizing and logistics coordination, Black Movement relationship-building, and speaking to everyone who is ready for culture shift about our mission and vision. So far, we have administered $86,000 in disaster relief grants for Hurricane Harvey for all Black people, mostly women with families, helped raise $30,000 for the Mama's Day Bailout efforts, and are building a partnership with Love Resists on working to End Cash Money Bail Outs. We’ve experimented with different models of organizing and are now in the process of re-launching the BLUUMicro30 groups that were formed at the Spring 2017 convening. We also committed to leading the Public Witness for General Assembly 2018, which is focused on creating 1,000 Domestic Violence Survivor Care Packages, equipping UU congregations to plug into the national movement to end money bail in this country, and supporting Uzazi Village, a center for ending racial disparities in Black maternal health outcomes. Part of this work also means doing it with communities who are as committed to justice and liberation as BLUU is. So we were happy to sponsor the Revive Love Tour with Rev. Sekou & the Holy Ghost and Side With Love (then Standing on the Side of Love) campaign and to send our then-BLUU Lead Organizer, Lena K. Gardner to Standing Rock with donations of medical supplies, clothing, and food, as well as to the Women’s March. The Revive Love tour visited six cities and included offerings of organizing strategy exchanges, relationship building and spiritual worshipful experiences with many groups on the ground doing justice work like Southerners on New Ground (SONG). And as part of Public Witness at GA 2018, we are providing support and care to Uzazi Village in Kansas City. Two primary needs became clear as a result of the 2017 Convening. First, that Black UUs too often do not receive spiritual care from their home congregations in ways that feel most meaningful to them. An invitation went out across BLUU’s various networks for folks interested in helping to provide that care, and the BLUU Ministerial Network, or BLUUMin, was born. This is a network of Black UUs with various spiritual gifts and backgrounds who show up in different ways to nurture and support the spiritual lives of Black UUs across the faith, whether they are connected to a congregation or not. BLUUMin is not just the people who show up when called, however; it is also the programming that enlivens the spiritual nourishment of Black UUs who come with spiritual journeys and leanings that are as varied as there are people. The spiritual care programming of BLUUMin includes offering Daily Affirmations via text message, facilitating meet-ups with Black UUs all over the country, and offering spiritual nourishment of all kinds, including worship. We made the decision to hire Rev. Mykal Slack as our nearly full-time Community Minister of Worship and Pastoral Care. From March 2017, BLUU has been providing space for worship and healing. We are deeply grateful for the pastoral ministry of Rev. Amanda Weatherspoon, who organized and led online worship on three separate occasions. Black UUs were in need of a space to be together that unapologetically centered Blackness, especially in the midst of a deep (and, sadly, ongoing) struggle among Black and Brown UUs to challenge the white supremacy culture embedded within and outside the Association and its member congregations. After those three services, Amanda teamed up with Rev. Mykal Slack, at that time new to the OC, and planned a worship service in BLUU’s Healing Space at General Assembly in New Orleans. It was a beautiful experience and folks made it clear that they were hungry for more. Beginning in September 2017, led by Rev. Mykal, we have held one online worship service via Zoom per month. In May 2018, because were again asking for more, we began offering two online worship services using the same platform. While these online services aren’t the same as being in physical space together, they are real, they are powerful and they can and do feed us as a community. It is, as it has always been, our birthright as Black folks in our faith to be able to breathe deeply, to release fully, and to embody and RECLAIM wholeheartedly what is truest about our Unitarian Universalism. So on the last weekend in April 2018, nearly 120 Black UU and UU-adjacent folks gathered in Kansas City, MO for BLUU’s first revival, which took place at All Souls Church. Revival was a special moment for Black UUs, local Black organizers, and the communities we hold dear to connect, worship together, and support one another. It was also an opportunity for BLUU to offer a kind of ministerial presence we’ve not offered before - to organize a public space where Black folks can be fortified in song, word, learning, and community, and to help hold sacred space for connection across the faith traditions and spiritual journeys that make us who we are as Black people and as Black UUs. Thanks to the initial fundraising efforts of the Office of the MidAmerica Region of the UUA, and a grant from the UU Funding Panel, BLUU was able to offer a life-changing experience to everyone who attended! We brought on a Revival Coordinator, put together an incredible revival planning team, offered worship and programming that honored our elders and our youth, built relationships with local Black organizers, and co-created a spiritually uplifting experience with everyone who attended. It is our work to expand the power & capacity of Black UUs within our faith and to provide support, information & resources for Black UUs. This is no less true for Black UUs who happen to also be religious professionals, navigating the complexities of believing deeply enough in the possibilities of our UU faith to serve, while, at the same time, facing racism and a white supremacy culture that is emotionally and spiritually violent. BLUU’s commitment is to provide pastoral and spiritual support through our Ministerial Network, build relationships, and continue to put pressure, where it aligns with our vision and goals, on the institution to do better and be better with respect to Black UU religious professionals who put time, energy, brain and heart space, and call into our faith. The Organizing Collective also recognizes that many Black folks come to UUism having been leaders in other faiths. Many have desires to continue serving in our faith but face significant barriers including the high costs of pursuing theological education and the uneven and unclear recognition of lay ministers in UUism across the country. The BLUU OC has communicated these concerns directly to UU leadership, particularly those with responsibility for educating the next generation of ministerial leadership at our UU seminaries and those serving in the UU Society for Community Ministries. We have communicated concerns around ecclesiastical endorsement, access to training and issues related to the recognition of lay ministry within our shared faith. We will continue monitoring institutional shifts around UU Lay Ministry and will communicate relevant updates in a timely fashion. Since BLUU’s beginning, the OC has felt that it’s an important spiritual imperative to speak out against injustices in society and within the institutions and organizations of our faith. From our first statement in September, 2015 to our challenge in Spring of 2016 for UU congregations to raise money for the Ending Cash Bail efforts across our country to our most recent public announcement declaring our support for the Palestinian people and their fight for freedom, we continue to be a voice for liberation and justice in our faith. Our public voice is foundational to BLUU’s presence. We feel called as a people of faith to be public and bold with our public statements. If we are quiet, it is another form of complacency. As people of faith we understand part of our role to resist oppression, and create new spaces for dreaming, for imagining and for liberation. We can only do this if we push ourselves to speak up and out against injustices and situations of all kinds. Follow BLUU on Medium to get immediate access to all our public statements. Each month the Executive Director writes to keep our community and our supporters informed on the newest projects. In case you missed a month, here is an archive of the Executive Director updates! In response to questions concerning the overwhelming whiteness of UUA senior leadership positions, three UU religious educators of color--Aisha Hauser, Christina Rivera, and BLUU OC member Kenny Wiley--launched a denomination-wide series of actions in the spring of 2017 to confront white supremacy within Unitarian Universalist institutions. Approximately two-thirds of the 1,038 UU congregations in the U.S. participated in some way. Aside from Kenny’s substantial role in the creation of white supremacy teach-in curricula, the BLUU OC provided several modes of assistance in the teach-in implementation. Leslie Mac created many of the initial graphics, church-tracking maps, and other early resources that helped a) get the word out about the teach-in, and b) gave the teach-in a home base in its inception. The BLUU OC helped with publicity, and the worship resource guide included words/readings/sermon excerpts from three members of the OC. While many UUs mistakenly attribute the teach-in to BLUU, it is also clear that the BLUU OC played a vital supplemental role in the success of the teach-ins. This new program extends our goal of justice making and liberation through our faith by highlighting a different project, program or organization each month that aligns with our Unitarian Universalist principles and the principles of Black of Lives of UU. The first initiative in May 2018 to be endorsed by BLUU and benefit directly from #BLUUSupports was the #BlackTransPrayerBook, an interfaith, multi-dimensional, artistic and theological work that collects the stories, poems, prayers, meditation, spells, and incantations of Black TGNC contributors, spearheaded by J Mase III and Lady Dane Figueroa Edidi. The second #BLUUSupports designee for June 2018 is the UU African Francophone Ministry, led by Rev. Fulgence Ndagijimana, that will provide spiritual guidance and support through an annual retreat and subsequent online connections including worship. For GA in 2018 BLUU decided to focus on programming for the BLUU Healing Space. We believe in exclusively Black sacred space as a way of healing our hearts and spirits from the woundings of white supremacy. We are grateful for the support of the UUA and the GA Planning Committee in supporting the creation of the space. Because BLUU’s community is spread out across the country, most of the ways to engage with BLUU are online. In our closed FB group, through our twice-monthly online worship services or our Spring gathering. Each year so far in the Spring, we’ve had a major gathering. In 2017 we held our Convening in New Orleans, and in 2018 we held our Revival in Kansas City, MO. In 2018, we are increasing organizing efforts. A cohort of the BLUU community attended the Allied Media Conference held June 14 - 17, led by BLUU’s Community Organizer Paige Ingram. We hope that this cohort, in addition to a few others, will help with the newly envisioned BLUUMicro30 communities based all over the country. Our aim is to launch BLUUMicro30 communities this fall. It’s our dream to have groups of Black UUs across the country that can gather, not just for fellowship and worship (though certainly for that), but who can also contribute to Black liberation through partnerships and growing collaborations through a variety of Black organizations and groups, as well as growing their own skills and perspectives on organizing for Black liberation. Independence and organization building is intense and important work. As this story is being published, BLUU is very close to filing our articles of incorporation and becoming an independent organization. We are very grateful for the financial and staff support that the Unitarian Universalist Association has given to BLUU. We wouldn’t have been able to build at the level we have been without the resources of the UUA. We look forward to continued partnership and collaboration in continuing to help bring more unapologetically Black Unitarian Universalist love and presence into the world. Since our inception, and since the decision to help fund BLUU from the Board of Trustees of the UUA, we have been building toward independence. In fact, our ability to receive the long-term investment of $5 million is contingent upon our incorporation as a separate legal entity from the UUA. And we are thrilled to be on this journey. BLUU is proud to be a sponsor and partner of the African Francophone Ministry led by Rev. Fulgence Ndagijimana. As part of this ministry, Rev. Fulgence is holding a retreat in Rwanda to help build up leaders for within the African Francophone community and serve as a place of worship and fellowship. A few folks from the BLUU OC and from BLUU Community are going to make the trip to meet African UUs on the continent. The trip is scheduled for August 2 - 5, 2018. This is the beginning of a partnership connecting the African and those of African descent diaspora and we are thrilled about this budding collaboration in cutting edge UU ministry. Our hope in sharing this document with you is to provide an accurate and relevant portrait or our efforts so far on behalf of and in community with Black UUs across the country. The goals that direct and center our work are grounded in an abiding spiritual commitment to live our faith with integrity, depth and energy toward building and sustaining justice for Black people in UUism and beyond. In the spirit of transparency and community, we are grateful for this opportunity to enact self-determination: to speak for ourselves, name our work and amplify our commitments in a manner that history will be required to record our efforts with accuracy and clarity. We are hopeful that this document has not only informed readers, but encouraged you to support the work of BLUU as we all work toward justice-making and liberation through our faith.